Friday night the Quantifinder identified the below study. I haven't updated it in over a year so I thought it would be interesting to do so. Results are much the same as they were a year ago. Low QQQQ volume in an uptrend has often signalled at least a short-term drying up of buying interest. Historically this has created negative expectations over the next several days and weeks. Much of the net negative thrust has often been found in the 1st two days following the setup. Below is a study that has been shown a few times in the Subscriber Letter. It popped up last night via the Quantifinder. It looks at what happens when two days of strong breadth fail to take the SPX to a new 10-day intraday high. I’ve re-run the stats and posted them below. Strong negative expectations turn positive under this scenario. I've shown before how positioning is important when interpreting action. This is another example of that. Originally published in the blog on 9/11/2008, the Quantifinder noted the below breadth-based study for Tuesday’s close. I re-ran it in last night’s Subscriber Letter and have updated it below. (Note: Up Volume % is tracked in the members chart area each night. It is equal to (Up volume / (Up volume + down volume). 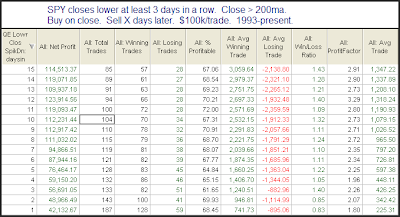 Note even the 2 most recent losers saw some sizable pullbacks. The 3/6/09 instance which came very close to the bottom was the worst of the bunch from a short perspective but still moved south by over 1.5% before launching higher. We spent Father’s Day at my in-laws. My father-in-law actively trades and a lot of what he does is pairs trading. He’s been getting more involved with pairs lately and comes up with some crazy ones. He does some testing on the computer but a lot of his testing is done “old school” with a pen and paper. So I brought my laptop over armed with Jeff Pietsch’s ETF Rewind tool. As part of ETF Rewind, Jeff has one worksheet that is set up to do pairs analysis. I rarely see him mention it on his blog, but it is really a cool tool. You can put in any ETFs or stocks (or combination) and see how playing mean reversions following extreme divergences would have played out over the last 6 months. It comes with an optimization feature that allows you see how extreme the optimal settings are and what the best lookback period would be. Running an optimization takes about 15 seconds. My father-in-law does swing trading so we focused on finding pairs that performed well with short lookback periods and less extreme divergences. He had a whole list he wanted to try out and we were able to zip through them and see which ones had potential and which ones didn’t. The tool doesn’t do detailed system testing but it's a great idea checker. So if you’ve thought about playing growth vs. value, or gold vs. gold miners, or even something crazy like AMZN vs. silver, it takes about 30 seconds to find out whether your ideas are worth exploring further, or whether you’re better off scrapping them. Personally, what I like best about the tool is that it also seems to act as an idea machine. There’s really no end to the possibilities and the more you play with it the more ideas you end up wanting to explore. It also gives you a sense of what to look for when considering certain securities for pairs. Some securities seemed to work well with almost anything paired up with them while others struggled with all combinations. It makes you think deeper about the nature and tendencies of certain sectors and security types. Anyway, enough from me. Check it out for yourself if you want. I know Jeff offers a 3-day free trial with all his subscription plans (yes – that includes Blogger Triple Play). Just make sure you spend some time playing with the pairs worksheet if you trial it. 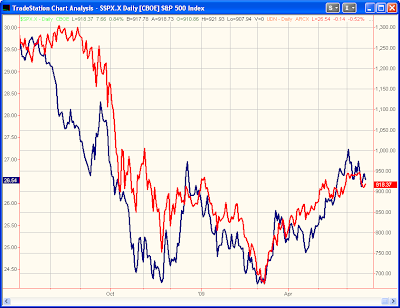 One relationship I’ve been watching lately is the S&P vs. the US dollar. To illustrate the relationship I’ve created a chart below. In red is the closing prices of the S&P 500. The blue is closing prices of UDN, which is the US Dollar Bearish Fund ETF. As you can see they’ve pretty much moved in concert over the last year-plus. Since UDN is a bearish fund this means that the S&P has actually moved opposite the dollar. A weak dollar has been cause for celebration and a strong dollar has closely preceded most of the drops in the S&P. But can the performance in the dollar provide a trading edge in the S&P? 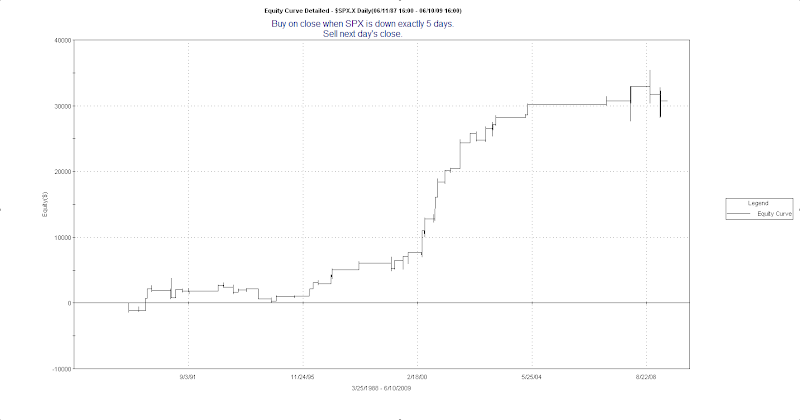 Below is the equity curve of an incredibly simple system. If UDN outperforms SPX on the day, go long SPX at the close. If UDN underperforms, go short SPX at the close. Basically you’re either 100% long or 100% short depending on how the dollar (inverse) performed that day relative to the SPX. For purposes of the test, no commissions or slippage are included. That’s more than an 82% non-compounded gain over the last 18 months. This edge won’t last forever. Still, this should demonstrate that the correlation between the dollar and the S&P is important. Moves in the dollar have a definite impact on the S&P. S&P traders would be well served to monitor the dollar’s performance closely and on an ongoing basis. Also notable about Wednesday’s action was that while the market has declined for at least 3 days in a row, the rate of decline has lessened both of the last 2 days. Back in September I found this pattern to have bullish consequences when the market was trading below its 200-day moving average. I decided to test it out when above the 200ma as well. I found that prior to 1987 there was no bullish influence based on the pattern. Since 1987 one has appeared. Here is the test using the SPY. First the base case without the slowing rate of decline requirement. Results here are quite a bit stronger than the base case. I noted in a tweet last night that big moves down are more short-term bullish when they aren’t occurring from a high. This was a bit of an understatement. They’re often short-term bearish. Yesterday’s drop moved the S&P 500 from a 10-day closing high to a 10-day closing low. Since 1960 there have been only 10 other times this has happened. In last night’s Subscriber Letter I show the results of those 10 instances. These results suggest more downside, especially over the next 2-4 days. For more discussion on big drops from highs you may want to review this former study. P.S. I just noticed that Dr. Brett also looked at the 10-day high to 10-day low move this morning. See what he has to say here. Instances are a bit low, but 17 of 19 occurences had at least one close below the trigger day close within the next 4 days. This study seems to suggest decent chance of some downside over the next few days. Don’t re-search the research…Quantifind it! The Quantifinder finds the pertinent studies for you. Check it out with a free trial. For those readers who happen to be in the Boston area I thought I’d let you know that I will be giving a presentation at the next Boston Investors’ Group meeting on Wednesday, June 24th. I hope to get to meet some of you there. One blog I enjoy reading is Cobra’s Market View. He shows a lot of charts and often does a good job finding where there is unusual action. On Thursday night he noted the CBOE Equity Put/Call Ratio had come in extremely low. I decided to do a study on performance following extremely low 1-day readings. When looking at put/call ratios I always normalize them with a long-term moving average. To understand why you may review this post from June of 2008. For today’s study I normalized using the 200-day moving average. The Equity P/C Ratio today came in at 0.55, which is a little over 25% below the 200ma of 0.74. I then looked at all other times the Equity P/C came in more than 25% below its 200ma. From 2004 until near the end of 2007 there wasn’t much of an edge provided. From November 2007 – present though there has been a strong bearish tendency. Seeing this graph would make many people wonder whether the negative performance is primarily just a byproduct of a horrible bear market. Even during the furious rally of the last 3 months low readings in the Equity P/C Ratio have been followed by strongly negative action. This leads me to conclude that the CBOE Equity P/C Ratio may provide a short-term edge and its suggesting downside for Friday’s trading. I’d recommend checking out Cobra’s Market View for several interesting charts and observations on a daily basis. P.S. – Would you like to be notified every time the above setup occurred? The Quantifinder can do it. Let the Quantifinder search through my blog and Subscriber Letters and alert you to studies relevant to current market action. Available with all Gold and Silver subscriptions. A few weeks ago I wrote a post that illustrated the edge buying 3 down closes has produced over time. There are a lot of ways to expand on the research in that post. Today I’m going to look briefly at what its meant to be down “X” number of days in terms of an edge for the next trading day. The table below looks at performance the day following a drop in the SPX of exactly X days in a row. A few things caught my eye here. The first is the % Wins column. It stayed pretty close to 50% no matter how many down days you’ve had. Basically a coin flip either way. The 2nd column that caught my eye was the Avg Win column. This is the column that provides an edge when you get further out. In general the more stretched market the stronger the bounce is likely to be. As I showed in the post that focused on 3 days down, the edge has changed over the years. More recently there has been a greater tendency for the market to reverse rather than trend. Below is the same table for the 1989 – present time frame. The % wins column here shows that the tendency to reverse after being down several days has grown stronger in the last 20 years. As in the 1st table, the Avg Win increases as the SPX gets more stretched. I demonstrated with the “Down 3 Day” trade that much of the edge has come quite recently. Below is an equity curve for being down 5 days. Much the same here. A good majority of the edge is attributable to the last several years. My takeaway is this. There is a long-side edge after the market has pulled back for several days in a row. A large part of the edge comes not from the chances the market will rise the next day, but the fact that you will be rewarded amply if it does. If you understand this and perhaps combine the fact that the market is down multiple days with other indications that a reversal is likely, then you can likely identify a strong upside edge. The Nasdaq/NYSE Volume Ratio is an indicator I haven’t discussed on the blog, and not too often in the Subscriber Letter. It is hitting extreme levels at this time and deserves some attention. One word of caution - levels will vary depending on data provider. So while the extremes may differ depending on whose data you use, results should be comparable at those extremes. I use Tradestation. On Tuesday the Nasdaq/NYSE volume 20-day average closed over 1.65. Below is a table showing 1-month returns based on this ratio. High levels of Nasdaq trading as opposed to NYSE suggest excessive speculation by investors. Once this level exceeds 1.4 (as Tradestation measures it), is has generally indicated a bearish bias. It’s not exactly a layup that a pullback should immediately begin. Still, risk appears to greatly outweigh reward when several of the top components are strongly overbought short-term. A brief look at the W/L Ratio suggests this. A pullback does normally come at some point in the next few days though. In fact of the 21 instances where the conditions were met, only one did not experience a close below the trigger day’s close within the next 4 days. One notable statistic from Thursday’s action was the Quantifiable Edges Nasdaq Volume Spyx indicator closed around minus 4. (For those uninitiated my volume spyx indicators look at comparative volume across multiple securities. When ratios get out of whack, it often shows up as an upside or downside spike on the chart.) Closes below zero are rare and often lead to weakness over the next few days. This is especially so when the market rises along with the low readings. Below is a study that exemplifies this. The number of occurrences is a bit low but certainly suggestive of a downside edge over the next several days. The edge appears the strongest over the 1st 2 days, when much of the damage has been done. 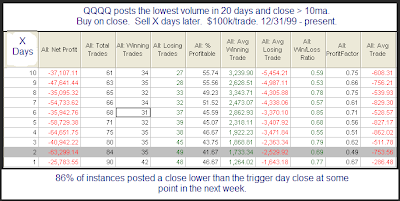 Not evident above is that 13 of 14 instances closed lower than the trigger-day close at some point in the next 3 days. 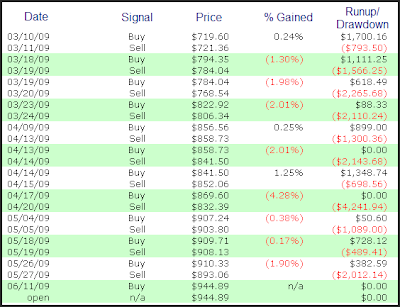 In order to gain a larger sample size I also looked at Nasdaq Spyx readings below 10. Results here are similar to the 1st test, but with a decent sample size. This all suggests a downside edge in the Nasdaq 100 over the next few days. Last August I looked at clusters of large low-volume selloffs. While the S&P hasn’t quite met the parameters laid out in that blog post, it has met the loosened requirements which were looked at in the 8/1/08 Subscriber Letter. The Quantifinder picked up on this last night and I thought it was worth another look. The basic concept is as follows. Strong moves down often lead to bounces. When you have a series of them occur on low volume then you may have favorable risk/reward on the long side. There appeared to be an upside edge when I ran this test last summer and there still appears to be one. Last week I discussed an indicator designed by Gerald Appel and published in his book “Technical Analysis – Power Tools for Active Investors”. He refers to it as the Nasdaq/NYSE Relative Strength Indicator (not to be confused with RSI). I changed it slightly for my purposes and instead of tracking the Nasdaq vs. the NYSE, I instead tracked the Nasdaq vs. the S&P 500. 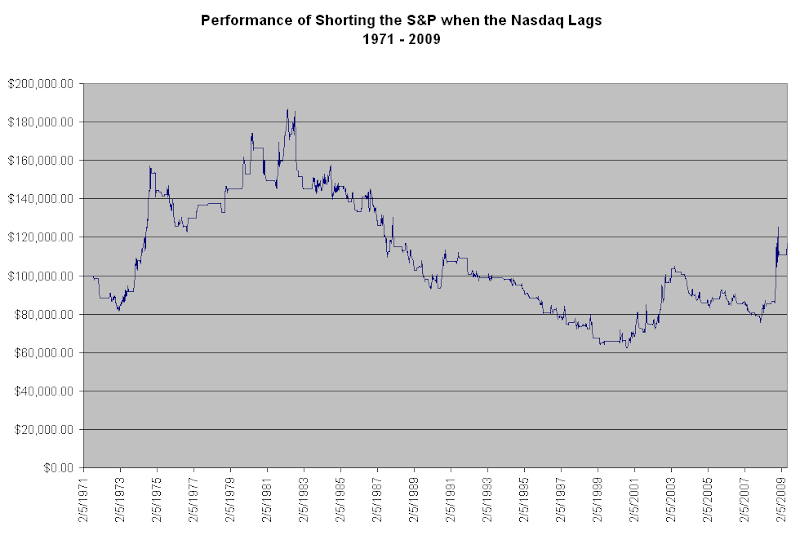 In last week’s post I demonstrated that the S&P had performed much better over time when the Nasdaq was in a leading position. I also provided a spreadsheet with the calculation and a model based on the indicator on the free downloads section of the website. When conducting research or designing models it’s important to avoid just looking at it from one angle. Today I’m going to explore a couple of other ideas that the indicator / model may have invoked in many of you. I’ve also updated the spreadsheet so that you can see how these ideas were tested as well. First, a quick refresher chart of last week’s results. 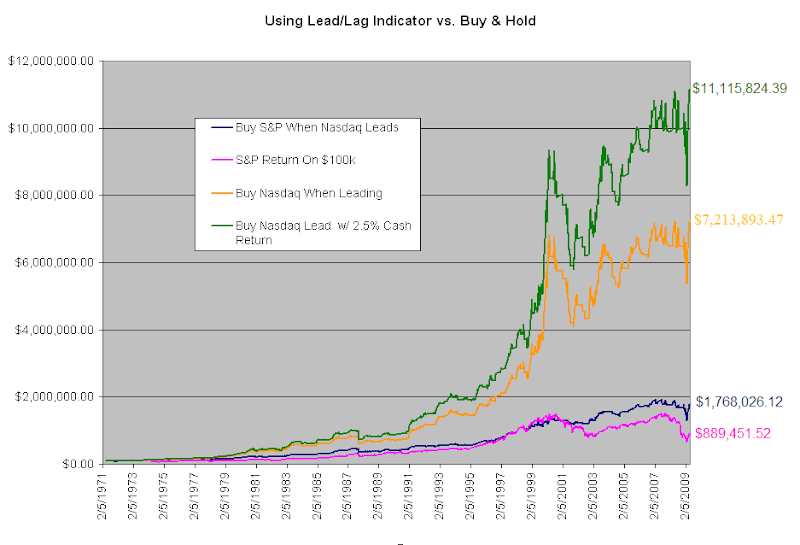 As you can see, utilizing the indicator would have greatly enhanced your returns over time. So if owning the S&P when the Nasdaq is leading is so favorable, does that mean you should short the S&P when the Nasdaq is lagging? After almost 40 years the current (recent?) bear market just got you back into the black. Certainly this isn’t an equity curve that suggests an edge. While some may be surprised based on how positive the previous results were, it makes complete sense. The strategy in this chart calls for shorting the leading index. I don’t believe I’ve ever seen anyone who has suggested that to be a good idea. But what if instead of buying the S&P when the Nasdaq leads, we buy the Nasdaq? It is the leader after all. Equity chart below. Hold on to your hats. Like the original test, dividends are not included. The annual growth rate if you earn 2.5% interest on your cash balance is about 13%. This is more than twice the S&P 500 annual growth rate of under 6% for the period. There’s also lower drawdown and you’d only be in the market a little more than half the time. Last week we saw how timing the market with this simple indicator can make a big difference. Here you see that a small tweak to ensure you’re in the leading index can juice returns much, much more. 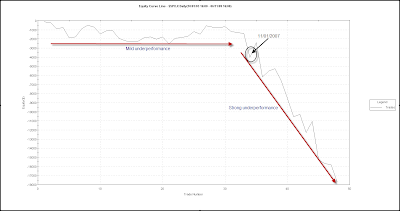 There are numerous other tweaks you could add to the model to improve performance or reduce drawdowns further. This is as far as I’m going to take it, though. The spreadsheet is still available and updated with the above tests and charts. You may download the updated version on the free downloads page. I’d suggest anyone who downloads it should use it as a starting point – not a finished product. For more ideas on using Excel for historical analysis I’d recommend buying Dr. Steenbarger’s Daily Trading Coach book. A few weeks ago I created a sample spreadsheet based on the lessons in that book. You may download that spreadsheet on the free download page as well. 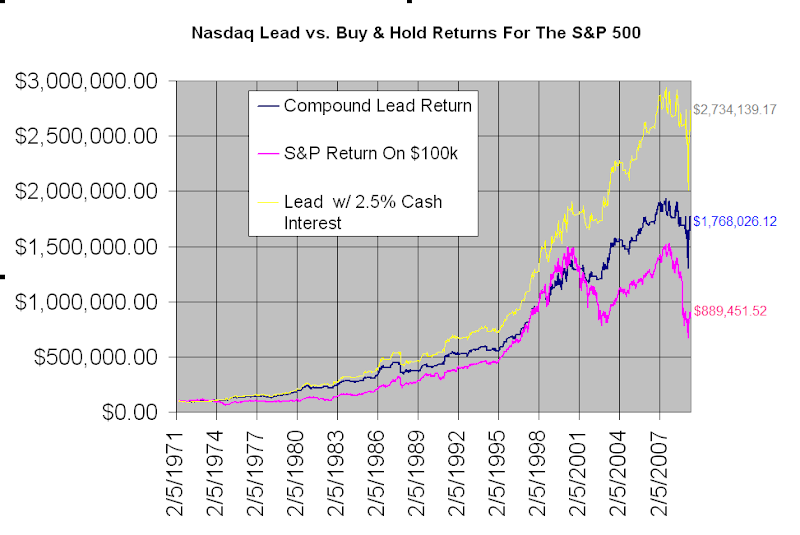 Registration is required for the Nasdaq/S&P Lead/Lag Model. 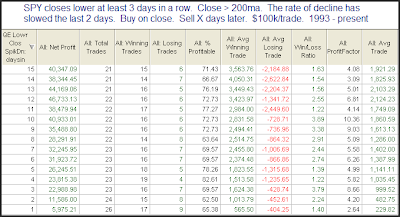 Registration is NOT required for the Daily Trading Coach Spreadsheet. 6/3/09 edit CXO has now deleted their old post and re-run the tests using the correct indicator. Their corrected post can be seen by using the link below. CXO Advisory posted a column this morning in which they attempted to refute the effectiveness of the 10-week Nasdaq/S&P 500 lead/lag indicator. In their column they referred to my post of last week and Gerald Appel’s book which I referenced as the origin of the indicator. They then ran several unrelated tests to show that 10-week RSIs are not effective in determining future returns. It is important to understand that RSI was not the indicator described by Gerald Appel nor used in my testing. Frankly, in the past I’ve found some interesting things on their site, but their lack of attention to detail here is flabbergasting. If they had either 1) opened the book, or 2) downloaded the spreadsheet I provided for FREE with the complete research supplied, they would have understood this. Instead they ran their own tests using a completely unrelated indicator. Their tests ran from 2005-present. They showed that over the 2005-present time period buying the S&P when the 10-week RSI of the Nasdaq was above the 10-week RSI of the S&P would have lost money. This doesn’t surprise me. 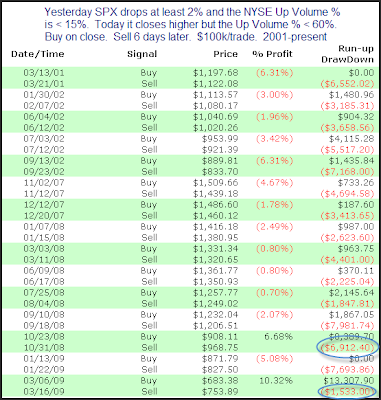 For anyone who has downloaded the free spreadsheet, if you plug a round number (such as $1,000 or $100,000) into the 12/31/04 row you can see the following results from then until 5/22/09. The S&P would have lost about 25% (not including dividends). The model (assuming 0% interest on cash and not including dividends) would have gained about 11.6%. In the next few days/weeks I will be publishing some more research that pertains to this indicator. I hope readers will find it valuable. In the future should CXO attempt to refute the work of others I would hope they at least make an effort to look at the work they are refuting. One final note, the Nasdaq/S&P 500 lead/lag indicator signaled a buy on Friday’s close. Subscribers to Quantfiable Edges are now notified of all model changes via the new Quantifinder technology.